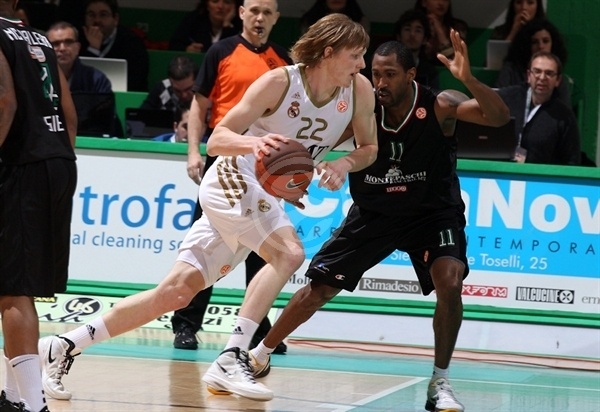 In a decisive Group F duel in Siena on Thursday night, Real Madrid managed to pull a prestige road win by 90-102, but was eliminated from the playoffs race due to the earlier Gescrap BB win at Unicaja, which forced the Whites to win by 23 points if they wanted to advance. As such, Group F is sealed with a three-way 4-2 tie in which Montepaschi Siena emerges as first, Gescrap BB second and Real Madrid third due to point-difference. 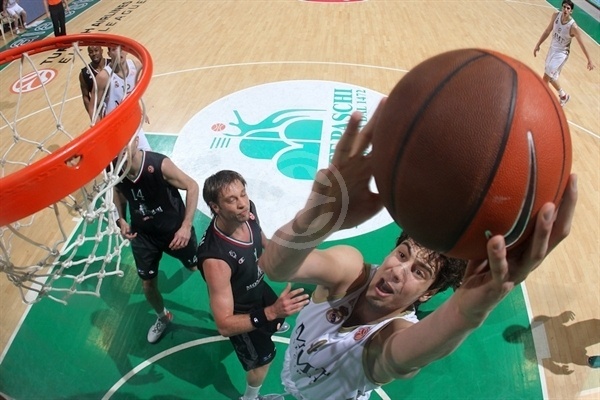 Unicaja stayed winless in the Top 16 with a 0-6. A huge Tomas Ress pushed Siena ahead with his threes but in the second half, Nikola Mirotic, Mirza Begic and Felipe Reyes put the guests ahead for good, but in the end it was not enough to advance. Real Madrid was led by Reyes' 17 points and 14 rebounds, Marty Pocius added 15 and Carlos Suarez and Ante Tomic had 10 apiece. For Siena, Bo McCalebb and Ress - with 5 of 6 threes - led the way with 15 points each, David Moss had 14 and David Andersen and Igor Rakocevic posted 11 each. The first minutes of the game saw Real Madrid meaning business with a fast 0-4 start behind Carlos Suarez and Sergio Llull baskets. 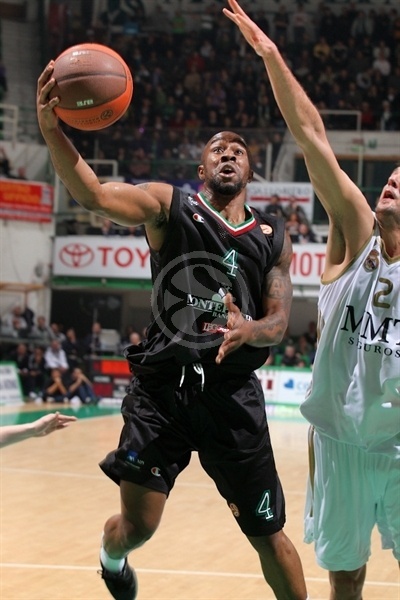 However, Montepaschi Siena gathered speed in no time as Bo McCalebb tied the game at 6-6 with a three. Real Madrid was trying to run for fast points, but the hosts did the same as Bootsy Thornton and Marco Carraretto blasted threes to make it 16-13 despite the guests' efforts in defense and looking to Nikola Mirotic inside in offense. The points festival on both sides continued. Real Madrid didn't miss a single two-point shot in the first period as Ante Tomic was fed by Mirotic for the 23-23 and then Jaycee Carroll hit a three to make it 25-26. It was big man Tomas Ress who scored the last basket of the quarter, anotherthree, naturally, to close it at 28-26 after 10 minutes. Ress started the second quarter as it ended the first, with a three. Tomic was the man inside for Real Madrid now as he was keeping his team in the game with points in the paint, but Ress blasted a new three and then Igor Rakocevic hit a three plus foul that made it 39-34. Points were pouring in as Jaycee Carroll had a couple of fast layups but Ress hit his fourth three in four attempts to keep Siena safe, 42-38. 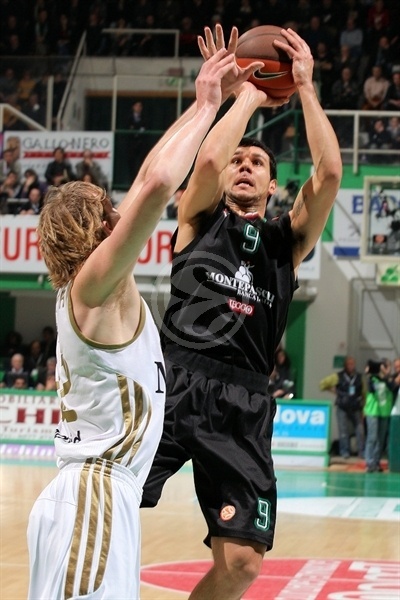 Real Madrid was not giving up and pressed in defense as Montepaschi was having more problems to find the basket now. Kyle Singler and Marty Pocius scored easy baskets to tie the game again, 50-50, but Rakocevic found the space for another three. It was Pocius again, with free throws, who made it 53-52 at thebreak. The first two minutes of the third period went without points until Mirotic scored for Madrid, 53-54. 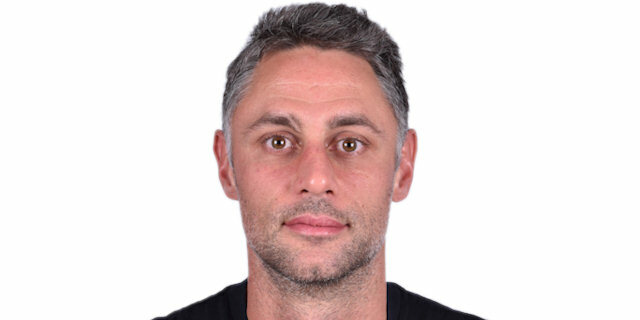 With Mirza Begic on court, the guests looked different as he soon was up to six stright points of his own for the 56-62 as the hosts had to call a timeout to stop the bleeding. David Moss came to the rescue for the hosts. Ksistof Lavrinovic was the sixth Siena man to hit a three in the night and then Moss was the seventh when he tied the game at 66-66. Mirotic was the cure that the guests needed with five points of his own to keep Madrid ahead, but Ress, again, nailed a bomb from downtown to turn things around. In the last plays of the quarter, McCalebb penetrated for a fancy layup but Pocius still had time to squeeze in a fastbreak layup that made it 75-76 for Real Madrid after 10 minutes. The decisive quarter started with Real Madrid giving it all. Felipe Reyes emerged in the offensive paint first with a spin and layup for 77-80 and then a huge offensive rebound that allowed Sergio Rodriguez to hit a three-pointer for the seix-point lead, 77-83. Reyes and Novica Velickovic teamed up for points as the guests managed to make it a 10-point game, 77-87. 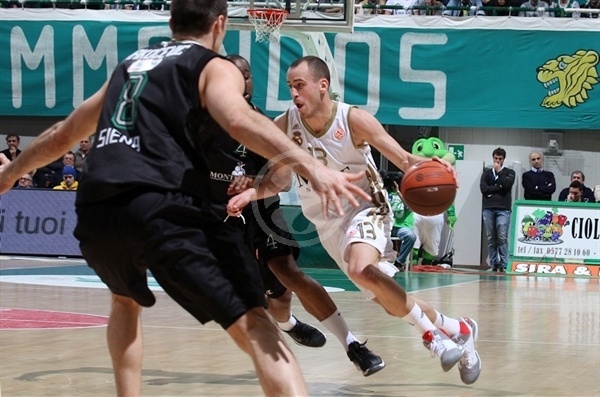 However, Moss, Zisis and McCalebb added points for Montepaschi at the time that Gescrap BB was beating Unicaja in Malaga. Real Madrid needed now a 23-point win to get in with barely 4 minutes left to be played. The guests moved the ball looking for good shooting options, but the clock was ticking away. Pocius hit free throws for 85-93, but Siena was getting offensive rebounds and getting second options as Andersen hit a layup for 88-93 with 2:30 to go. Real Madrid was taking too long in offense to attack the basket and it was clear that it would have no time to get the difference it needed as the fans in Siena celebrated another passage to the playoffs. "I’m happy because the first place is a very good result. I feared this game because Real Madrid is one of the best teams in Europe, that can play in offense for 40 minutes at high level in fact it was a close game for a great part of the game." "Congratulations to my team. It was not easy to come here and win by 20 points. Everybody will remember this game not only for the result but also for the great basketball both teams played." "We are happy about being in the playoffs, but too bad we lost a game at home tonight. We have to win at home. We have not played good defense and we have had problems with rebounds, I think those are the reasons of our loss. Real Madrid is a great team who are playing great at this point in the season. We are happy about the first place and we are already thinking about the next games."